The Classic DK Mode or "Huge head mode"? Re: The Classic DK Mode or "Huge head mode"? Well, I believe the only problem that they'll get is resizing the hitbox every time a map is selected (since the hitbox's wireframe is something strongly linked to the model). Working around to be programmer, voice artist, designer, compositor and writer. If you want help, I'll be much obliged in helping you. P.S: No, I'm not behind you with a bloody screwdriver. I'm a nice guy! The simple answer is, it's a lot of work while we are still looking for a character modeler. That would be hilarious if we had DK mode. DK mode would also require big arms and bigger weapons, too. That's where the real issue starts. Scaling the head wouldn't be a big problem, but the arms are. Because you wouldn't just need to scale the mesh but also the Animations for it to work correctly. It would be easier to have fat characters. The logistics of a good implementation of DK mode is a ton of work for little payoff. The only feasible implementation for us is we'd need 2 character rigs, twice the number of character animations and a second set of characters and weapon models that are sized differently. All of our character models and animations are currently in need of redoing from scratch, if we were ever to do DK mode we'd redo all of that before hand. The bodies are also smaller than usual. If only Source had a feature like Unreal 4 does where you can add bone modifications to animations without having to make new rigs or edit said animations. There's a little bit of work to get it to work but it's a hell of a lot less work that duplicating rigs & animations. I don't know programming in Source but it sounds like this feature isn't a thing for Source, only thing I know that is similar is that one tool in Gmod that lets you resize bones however it doesn't effect the child bones & thus wouldn't work correctly for this. Assuming that could be ported into GE:S to begin with. 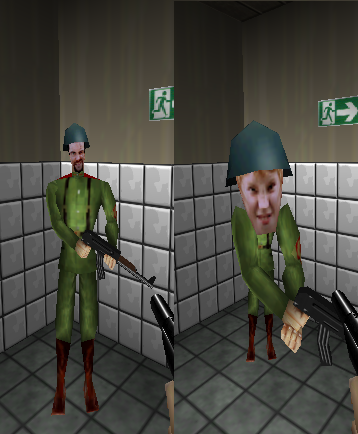 Already have issues with servers messing with gravity and other settings at the moment - which is also fun, but it gets to be annoying when there's 4 populated servers and 3 are anti-grave or running mods which totally change the balanced, classic GoldenEye gameplay many of us are looking for when we log in to the mod.